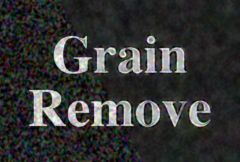 Similar to GrainRemove but only applies the affect to areas specified by the Mask input. Smooths the source clip while retaining the edges. To adjust the parameters in this effect, first use the show:EDGES option to inspect which edges will be retained and adjust Edges Threshold, Edges Width, and Edges Scale until the important edges are fairly sharp and bright but not jaggy. Then return to show:RESULT and adjust the smooth parameters to remove the appropriate amount of grain.